If you’re always travelling, or a stickler for almost the exact time, the Seiko Astron GPS watch could be the smart wristwatch for you. With the touch of a button, wherever you are in the world’s 39 time zones, the Seiko Astron uses GPS satellites to divine the local time, and adjusts its time setting accordingly. And given that it does so via atomic clocks on those satellites, it is “is accurate to one second every 100,000 years”. Except for Daylight Saving situations though, unfortunately that requires a manual adjustment. In addition to not worrying about the right time in the right place, you’ll need not worry about winding the watch, or battery level, as the Seiko Astron is solar-powered. 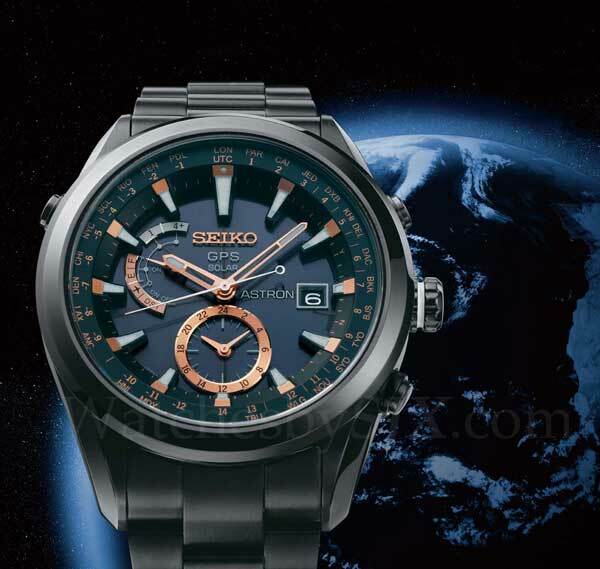 Seiko has made a small range of Astron watches. There’s a limited edition run of 2,500, with a high-intensity titanium case, ceramic bezel, and silicon watchband. In addition the this limited edition, there are three other models in high-intensity titanium and two in stainless steel. European pricing for the Seiko Astron GPS watch is in the range of 2,000 to 3,300 Euros. Click on the thumbnails below to look at a larger version of these images of the Seiko Astron GS watch.